Since coming into power in 2006, Prime Minister Stephen Harper has taken various steps to redefine Canadian citizenship and reassert its “value” under a territorial, militaristic, loyalist, conformist and Anglocentric interpretation. As numerous commentators have noted, these reforms have unfolded within Harper’s broader campaign to (re)define the meaning of being Canadian along conservative ideals and British traditions. Conservative officials deny the existence of such an underlying agenda, arguing their reforms simply addressed specific problems in the system, such as massive fraud and application backlogs. Recent citizenship debates in English Canada have dwelt mostly on the question of whether it is a right or a privilege; on issues of legality and process; and on measures of loyalty, attachment or worthiness. But there is more to it. In this three-part series of posts, I explore the historical narratives and political myths supporting the Conservative government’s parochial views on Canadian citizenship, and how they affect Canada and its expats’ places in the world. Part one will focus on the policies; part two on the historians; and part three on Canada’s diasporas. It’s about history. But whose? How can a country so proud of its well-documented immigration history be so uncaring and ignorant about its emigrants? That question may have crossed the minds of Gillian Frank and Jamie Duong, two Canadians residing in the United States, who have challenged, under the Charter of Rights and Freedoms, a provision in the Canada Elections Act that removed the voting rights of expatriated citizens (or “external voting”) living outside the country for more than five years. Their case brought significant media attention to that rule, which has been in place since 1993 but was rarely enforced until 2007, after Harper took power. After that, the five-year residency rule disenfranchised an estimated 1.4 million expats. 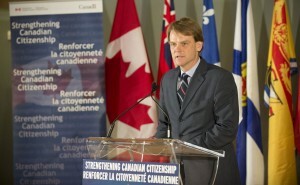 Since then, Conservative ministers have greatly limited the scope of and access to Canadian citizenship. Let’s recap. In 2009, an amendment to the Citizenship Act (Bill C-37) limited the bestowing of citizenship by descent to one generation born abroad (except for military personnel and public servants stationed overseas); in other words, expatriated grandparents can no longer bequeath their Canadian citizenship to their grandchildren. 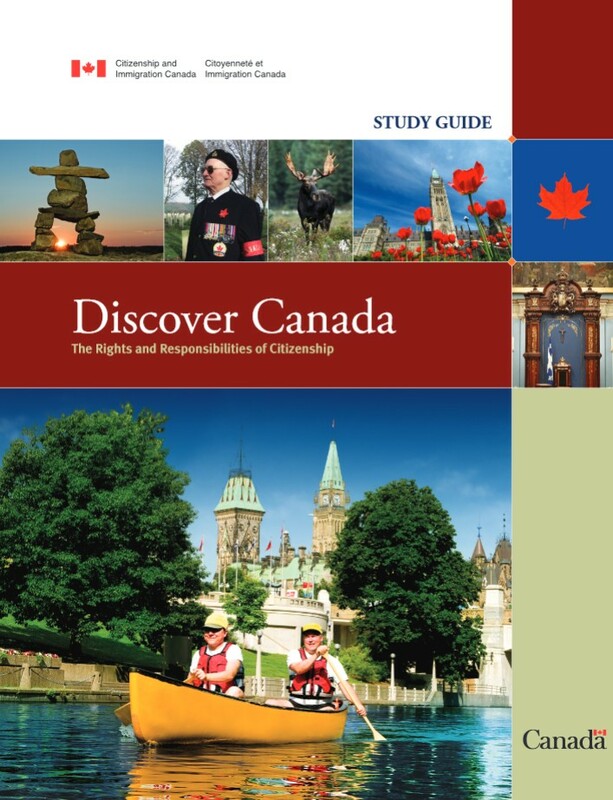 That same year, the government released its citizenship study guide, Discover Canada: The Rights and Responsibilities of Citizenship. 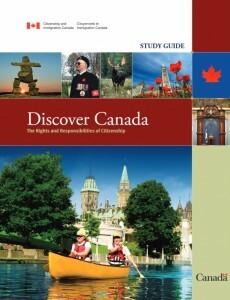 As various commentators have argued, this guide offers a narrow conservative view of Canadian history that leaves out important political figures, national/cultural groups, episodes of conflict, social movements and progressive policies that transformed Canadian society – you can find a sample of these critiques here and here. The militarization of citizenship was furthered in 2011 with the introduction of Canadian Forces personnel at oath taking ceremonies, where they have taken prominent positions alongside the presiding citizenship judges. Alexander and his predecessor as minister, Jason Kenney, often note that fraudulent applicants “cheapen the value of Canadian citizenship,” or that “citizenship is not for sale.” Their assessment rests on an understanding of citizenship as a commodity or a reward, which gains or loses value according to supply and demand market notions: the harder it is to get it, and the easier it is to lose it, the more valuable it becomes. Ironically, their supply-side management of citizenship is ruled more by protectionist than free-market thinking. However, the government’s reforms – including Bill C-23 (2014), which made it harder for citizens without listed addresses to vote – essentially devalued Canadian citizenship by limiting the scope of the Charter. This is the view of a large number of civil and human rights advocates, lawyers, and members of the public, who have contributed over 112,000 signatures (as of August 27, 2015) to an online petition opposing Bill C-24. 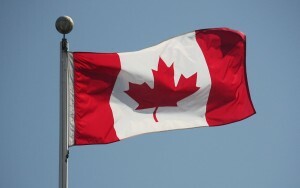 Their criticism has focused mainly on what they see as the creation of a two-tier citizenship system, where “second-class citizens”, or those holding or eligible for obtaining dual citizenship (even if born in Canada) can have their citizenship stripped for actions deemed “anti-Canadian.” This adds a new discretionary system of punishment for actions already under the purview of criminal law, and for persecuting individuals with ideological views contrary to Canada’s liberal order. In this scenario, Omar Khadr, whom the Conservatives argue poses a terrorist threat, is at risk of losing his Canadian citizenship, since he is eligible to become an Egyptian citizen by descent. Finally, following Frank and Duong’s challenge in February 2014, the Ontario Superior Court Justice Michael Penny declared that the five-year external voting limit was unconstitutional and that it was not for lawmakers to decide who was “worthy” of exercising their Charter rights. In July 2015, the federal government successfully challenged Penny’s ruling at the Ontario Court of Appeal, which overturned it by split decision. The latest ruling argued that allowing non-resident citizens to vote on “laws that affect Canadian residents on a daily basis, but have little to no practical consequence for their own daily lives,” would “erode the social contract and undermine the legitimacy of the laws.” The Appeal Court also determined that Penny’s decision had been clouded by the government’s assertion that non-resident citizens “do not have the same connection” to Canada as residents, which turned the case into a discussion over “worthiness” rather than democratic traditions. Such public reactions tend to flare up whenever Ottawa evacuates expats from conflict zones around the world. Especially after 2006, when the government evacuated 14,370 Canadians (some having lived abroad for decades) from Lebanon, of whom nearly half are reported to have returned shortly after. At this point, the moniker “Canadians of convenience” emerged in the public sphere, popularized by then Conservative (later Liberal) MP Garth Turner. Like him, many commentators focused on the amount of taxpayers’ money (about $85 million) spent on rescuing these absentee citizens who supposedly did not pay taxes in Canada, and whether or not they deserved it. Though unbecoming of a country that prides itself of ranking consistently among the world’s top ten contributors of humanitarian aid, this thriftiness has swayed the debate over the rights and duties of long-term expats. After the Lebanese evacuation crisis, Harper’s fiscally conservative government promised to review the 1977 Citizenship Act, which had enshrined dual citizenship. Already in 1993, a parliamentary committee discussing amendments to the Elections Act entertained the removal of citizenship from those who voluntarily naturalized elsewhere. One of the expressed concerns was that Canadian emigrants, on whom Ottawa had little data, might be voting in Canada despite paying no income taxes. Some parliamentarians were willing to allow external voting as long as absentee citizens proved their intent to return. Eventually, Prime Minister Brian Mulroney’s government compromised and introduced external voting rights within a five-year absence period. Michael Ignatieff campaigns, 2011. Wikipedia Commons. Liberals have also contributed to the negative characterization of Canadian expats. Former Minister of Citizenship and Immigration Judy Sgro criticized the lack of patriotism of dual citizens, and stated that the benefits available to emigrants are “ripe for exploitation.” Previously, Prime Minister Jean Chrétien had revoked Conrad Black’s citizenship after the latter accepted a seat in the British House of Lords. Of course, this was before Stéphane Dion and Michael Ignatieff became party leaders and had their commitment to Canada questioned by Conservatives, given their dual citizenship and long-term absence in the latter case. Jack Layton too criticized Dion for holding dual citizenship, which placed the NDP in an awkward position, given that Thomas Mulcair has expressed his pride in being a citizen of both Canada and France. Mulcair has since stated that he will renounce his French citizenship should he become Prime Minister of Canada. Such nativist fears over “dual loyalties” have a long history in Canada, from the violent persecution of Catholic immigrants in the nineteenth century, whose allegiance was believed to rest primarily and uncritically with the Holy See, to the internment of Japanese Canadians and others during the Second World War. All three leading parties in Canada have harnessed nativism and anti-immigration sentiment at different points in their history. However, this has not stopped partisan politicians from slinging mud at each other’s glass houses, as was the case when Minister Alexander recently invoked Prime Minister Mackenzie King’s racist immigration policies to defend himself against MP John McCallum’s accusations that he promoted anti-Muslim rhetoric for political gains. Had this slinging continued, the Liberals might have brought up Prime Ministers John A. MacDonald’s Chinese Head Tax; Robert Borden’s Western promise of “A White Canada;” or John Diefenbaker’s anxiety over rising Italian immigration. The New Democrats, in turn, would reproach the internment of foreign nationals during the First and Second World War under the Liberals and Conservatives and their long-held preference for northern and western Europeans immigrants. To which the accused would snicker at the NDP’s holier-than-thou grandstanding and remind everyone of their former anti-Asian stance in British Columbia or the Canadian labour movement’s own racist history. Such a spectacle would have shocked the many Canadians who never encountered their country’s racist past in their school textbooks or citizenship study guides; certainly not in the historical narrative that Harper wants them to embrace. Stephen Harper’s immigration and citizenship policies may be based on fictions, but they are widely accepted as truths by Canadian nativists. These can be found in all political parties, but are currently only given a platform in the Conservative party. [i] Walter Nugent, Crossings. The Great Transatlantic Migrations, 1870-1914 (Bloomington: Indiana University Press, 1992), 159; Howard Palmer, Patterns of Prejudice: A History of Nativism in Alberta (Toronto: McClelland and Stewart, 1982). Dr. Gilberto Fernandes is a researcher and public historian, and one of the co-founders of the Portuguese Canadian History Project. Read more at fernandesgilberto.wordpress.com.